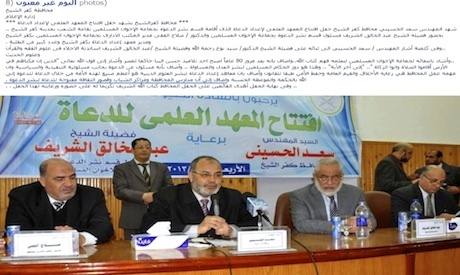 The Egyptian Arab Union for Independent Theatre (EAUIT) and the Egyptian Creativity Front (ECF) have expressed concerns regarding statements by the governor of Kafr El-Sheikh, Saad El-Husseiny, a senior member of the Muslim Brotherhood, at the opening ceremony of the Scientific Institute for Islamic Preachers. In his statement on 20 February, El-Husseiny implied the cultural palace of Kafr El-Sheikh, which is under renovation, would be open to Islamic preaching. The statement caused fury among intellectuals and artists at the EAUIT and ECF. Both have released statements addressing the Culture Minister Mohamed Saber Arab via Facebook. In two separate letters, they condemned the governor's statements and expressed their fears that the cultural palace would be transformed into the Islamic Centre for Quran and Sunna Studies. "We condemn statements by Governor Saad El-Husseiny that prove to be based on a poor intellect and managerial ignorance," read the EAUIT's statement. "Culture has its respected status within Egyptian society, as does religion," the statement read. On 5 March, in its note to Ahram Online, the union described the comments by the governor as "a disgrace to Egyptian society." The Egyptian Creativity Front called on Culture Minister Saber Arab to take immediate action to protect Egyptian culture. "Egypt has high illiteracy levels and we need culture as much as we need religious centres to educate the masses and develop the nation." During a visit to the Aisha Fahmy Palace on Sunday 3 March, Arab disregarded El-Husseiny's statement. "There are no such talks ... cultural palaces belong to the people and don’t function according to any political or religious ideologies." El-Husseiny's troublesome statement was posted on the Facebook page of the governorate's Media and Communications Department. The page includes pictures and captions of the event, where El-Husseiny said: "Preaching God's wisdom and religion is the best product of the nation and thankfully public schools, youth centres, and cultural palaces are open for advocates to preach." However, the issue starts becoming complicated once we look into a series of denials from some officials. According to an interview with Al-Ahram Arabic on Monday 4 March, General Organisation of Cultural Palaces chief Saad Abdel-Rahman denied the governor's statements all together. "There are no such statements and if so, the governor is not entitled to interfere with our work. As a governor, he has no say when it comes to monitoring and managing any of Egypt's cultural palaces." Abdel-Rahman added that "besides, the cultural palace of Kafr El-Sheikh is currently undergoing major renovations, so it is not even functioning." Following Abdel-Rahman's interview with Al-Ahram Arabic, EAUIT leader Ahmed Kasim commented to Ahram Online on Tuesday 5 March: "Now that the issue is out in the open, Abdel-Rahman denies it!" "We will not stand still and watch the entire country change its cultural heritage and identity to fit certain political agendas. Those palaces are our home. As mosques and churches are protected by law and society, cultural institutions should be too; and it will be our duty if the ministry does nothing," Kasim said. On a similar note, the union addressed Ahram Online via its Facebook page saying: "Denying such public statements that provoked all artists and intellectuals is very irresponsible and unprofessional." El-Husseiny's head of Media and Communications Department, Ahmed Misbah, told Ahram Online: "There are no such statements. In fact, the governor has been requesting funds from the Ministry of Antiquities and Ministry of Culture to finance the renovation project. "El-Husseiny has been working on a number of projects to bring about prosperity to Kafr El-Sheikh," he added. Kheiry Hamdeen, manager of the cultural palace in Kafr El-Sheikh, said: "I am aware of what is being said on Governor El-Husseiny's behalf but it is all nonsense. The culture palace is not even open and the governor respects arts and culture." "He will even hold a cultural conference next month inviting Egyptian intellectuals and artists," Hamdeen said. "It is the first of its kind in the smaller Egyptian governorates." Angered by contradictory statements, Kasim told Ahram Online: "We are constantly surrounded by cowards and liars. The statement by El-Husseiny was made public and all of Egypt's intellectuals and artists responded to his unreasonable decision." "We await the ministry's handling of the situation. But if it fails us, then we will take over all palaces, go on strike and not allow anyone in or out. Those are our territories and we have to protect them."